We look at ourselves as we walk the streets/malls in the windows of stores and restaurants. Mirrors and reflections have been used since time began for magic, scrying, fortune telling, protection and summoning the dark spirits. 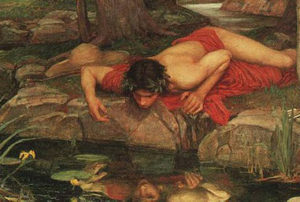 The word narcissism originated when Narcissus falls in love with his own image. Morgana in King Arthur’s Court used mirrors and liquid (water, oils or blood) to see what has happened in the past, present and future. We modern day humans both love and fear what our reflections show us. We look at ourselves as we walk the streets/malls in the windows of stores and restaurants. We use mirrors in our scary stories. Calling forth the spirits/ghosts of angry/vengeful beings is common at pajama parties or those worshipping evil. Even the bible has noted, “Through a glass darkly…” And don’t forget Alice in Wonderland, using the mirror to enter into her own psyche and find adventure and learning about the many aspects herself. As natives of Turtle Island, the indigenous people didn’t have mirrors, but did use pools of water; rivers, ponds to see their reflections. But, more importantly, your own spirit was reflected back to you by the people you lived with: your tribe/clan/family. One knew how they treated others, living their lives in balance, honor, respect and gratitude. 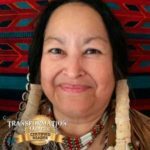 It was just another aspect of life that fasting, ceremonies like sweat lodges, the Sun Dance, seeking visions and revealing dreams were commonplace tools to help you in your journey. Your integrity was very much appreciated by all. 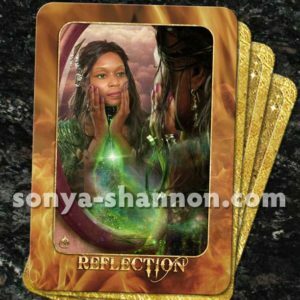 In the Reflection card we see a beautiful girl looking at herself, holding her hands to her cheeks. It is an exercise we all need to do at varying times in our lives. We need to look and understand the image we are giving to the world around us. Is this image different than what she feels inside herself? It is time to reconcile the inner person with the outer image she projects to the world. It is a time to learn to appreciate her own inner beauty as well as her self-esteem and worth. Between her forearms is the Light of the Universe! It is time to let her own Light integrate into the Wholeness of her being. Beneath the bright, shining Light we see the illuminated caves and caverns she hid away. Both good and bad has been brought to Light. It is a good time to turn within and clean house, find her true self and to let the fear go. It is time to know and recognize her own power, as she uses the power of her Creator to flow in, around and through her being. It is time to extend her Love and Light to all around her. In the Integration card, we see a beautiful child reflected back to us. Our inner child in all her innocence and curiosity, but she is not mature yet. As we touch her chin we see the Sacred Spiral circling upward. She is surrounded by bits and pieces of her life in a random pattern as illustrated by the boards. The lack of insight, maturity and growth keep her unhappy. It is time to integrate your inner child into the rational, understanding adult you have become. No more temper tantrums or silly stomping of your feet when you don’t get what you want. You are learning to use your mind, energy and love to create what you truly want. You no longer are just reacting to life’s circumstances; you are now creating your own reality! In the upper left corner we see her as a more self-assured and wiser self. It is the integration of our willful child into the much more peaceful and mature adult. Check out Michelle Whitehead’s article on The FIRE Element in Separation and Divorce.